I started off by stamping the dahlia image and colored it with Copics. Next I added some shading with my Prismacolor pencils and some gamsol. Highlights were added with Copic Opaque white on a toothpick. Same thing for the leaves. Then that was all masked off and I used a stencil first in one direction and then the opposite to make the plaid look. Popped the colored piece up on dimensionals, added a few enamel dots and done! Well that sounds simple but it took me a couple of hours!!! Hi Lee-Anne, I love the colouring on your pretty flower, it looks so dimensional! Thank you for joining us at ATSM. End result [after all the hard work] is awesome! Great colour comb and love that big flower! 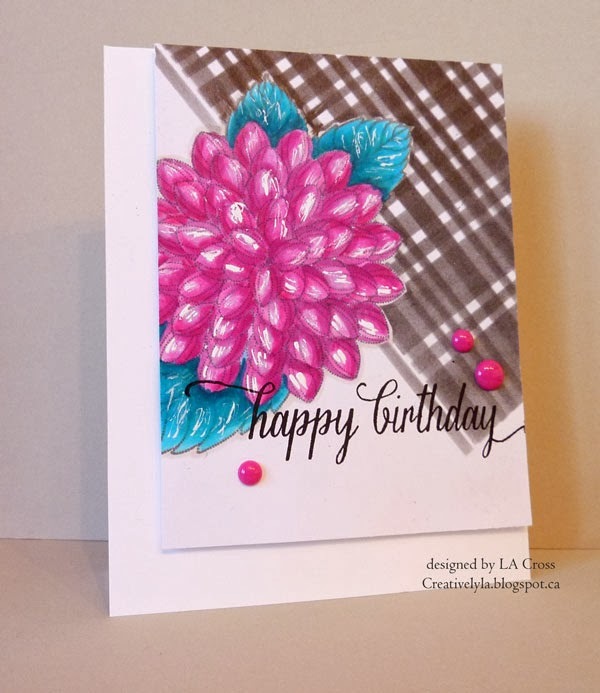 What a beautiful interpretation of the inspiration piece – your coloring is lovely, and I adore the stenciled panel!! I appreciate your lengthy process to produce a gorgeous end result! Adore this gorgeous bloom! The stenciled brown plaid (clever!!) is awesome in this design! So glad that you join the fun with us at Runway Inspired Challenge! You're so good with the stencils, Lee-Anne. I love how you made the plaid and your flower is gorgeous. Love what you did for the plaid! So creative and it makes you flower pop! Beautiful colors and card! The stenciled plaid looks fabulous with the gorgeous flower. So lovely. Wow, love the expressive colouring on the flowers Lee-Anne – offsets beautifully against the plaid! Thanks for playing along with us at the Runway Inspired Challenge! stunning coloring! This was definitely worth the time it took! Outstanding! Oh this is so pretty 🙂 love dahlia with that Chocolate BG, thank you for sharing with ATSM !! Gorgeous flower! I love your colouring! It's very realistic! Thanks for joining us at Runway Inspired Challenge!